Vaguely worded ‘counterterrorism’ laws are once again being used by the Egyptian authorities to clamp down criticism and silence campaigners and activists. 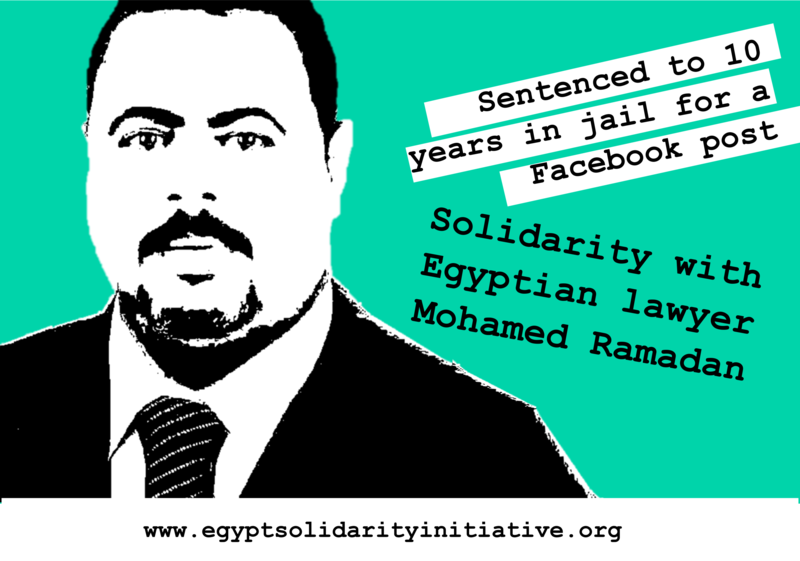 Alexandria-based lawyer Mohamed Ramadan, who is well-known in the city for his work in defending trade unionists and political activists, was sentenced to ten years in jail this April for allegedly ‘insulting’ Egyptian president Sisi on his Facebook page. He has also been banned from using the internet for five years and sentenced to five years under house arrest on the completion of his sentence. Ramadan was in hospital at the time of his sentencing. According to his lawyer Mahienour el-Masry, the judge refused to hear the defence team’s request to adjourn the case on medical grounds. Although the judgement can still be appealed, Ramadan’s sentence has been seen by many as a worrying sign that the authorities are using the state of emergency imposed following the bombing of two churches earlier this year to crack down further of freedom of expression. A further wave of arrests of current and former activists with the Dustour and Bread and Freedom political parties has followed Ramadan’s sentence. Those arrested and detained include Nael Hassan, a member of the Dustour Party and a former police officer who resigned from his post before the 2011 revolution, arrested on 21 April, and like Ramadan, accused of ‘insulting the president’. According to local media reports he is also facing charges of “involvement with a group inciting public opinion, obstructing state institutions and attempting to overthrow the regime.” Three other men from Alexandria, El-Shazly Hussein, Islam El-Hadry and Ahmed Ebrahim were also seized from their homes by police and have been added to the same case. Meanwhile security raids are reported to have been taking place across the country, targetting activists from the Dustour Party and Bread and Freedom parties. ← Middle East Solidarity magazine issue 5 now out!